In the world of medicine, mechanics, and technology, it seems like if we know the cause of a failed system, we can figure out how to fix it. I am not an expert in those areas, but from my own personal experiences, I know that when there’s been something wrong with my car and my computer, the experts always find the cause and fix the issue. As for medical issues, that is not always so clear cut. Medicine is often a rule out game. However, there are many things in medicine that have a solution when the cause is known. What about self confidence? Self confidence is a feeling and a belief. It is not a mechanical part, however, if you know the cause of why it might be lacking, then why can’t you fix it? When it comes to human behaviors, emotions and perception, it’s not always that simple, or is it? I have noticed that many of my clients lack self confidence in one or more areas of their lives. If only they were consistent with a particular behavior or practice, they would boost their self confidence in no time and dramatically change their lives. The lack of consistency seems to be the main issue. That in itself can eat away at self confidence. Therefore, consistency is the mechanical part that is needed to fix the problem. Don’t you wish you had a consistency button or a consistency part that could be wired into your brain? You could just push it and just like a computer, when pushed, it would turn on. Unfortunately, we, humans are not designed that way. So how do you activate this consistency button to boost your self confidence? Take the following steps and keep it simple. 2. Write down how this would change your life if you were to be consistent in this area for 21 days. Write out all the positive ways it would affect you or those around you. Be specific in how it would make you feel. Read it everyday! 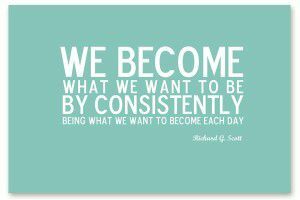 That means being consistent! Put it somewhere you will see it. Use large bright colored sticky notes and place it where you can’t miss it! 3. Create a consistency button out of paper or other materials and decorate it. Place it somewhere you can push it everyday. Ask someone to hold you accountable. Don’t pick someone who is going to criticize you or make you feel bad if you miss a day. Pick someone who you know would lovingly support you in accomplishing this goal. You can ask them to check in with you daily via phone call, text, or email. You can ask someone to be your partner and do the activity together. 4. You can set reminders on your smart phone or other items to remind you of your goal. 5. Lastly, if none of these work for you, I suggest you hire a coach. 6. Acknowledge yourself at the end of the day and set up a reward for being consistent that you can earn after being consistent for 3 days or more. Good luck and let me know how you do!!! Would love to hear results of your consistency!